Peel the figs, setting the skin to one side. Lay each piece of flesh on a square of baking paper, cover with cling film and roll out with a rolling pin or by hand; place in the fridge if not used immediately. Cook the skins with half their weight in sugar for 5 minutes. Cook the figs with the sugar to 105° C; the jelly will form by itself. Cook 80 g of fig skins cooked in sugar in a non-stick pan over a low heat with the beaten egg, cream and salt, to make 4 small frittatas. Bring the milk to the boil with the sugar, the powdered milk and the carob flour; pour over the egg yolks, mix and cook at 85° C. Sieve and add the sweet Sherry, stirring at –8° C.
Bring the water to the boil with the sugar, cool and add the sake, mix and freeze. Cut the prosciutto into strips and bake in the oven at 180° C until crisp. Peel the potatoes, cut into fine slices, leaving them in water, then scald them, dry and fry at 130° C, until they become crisp. 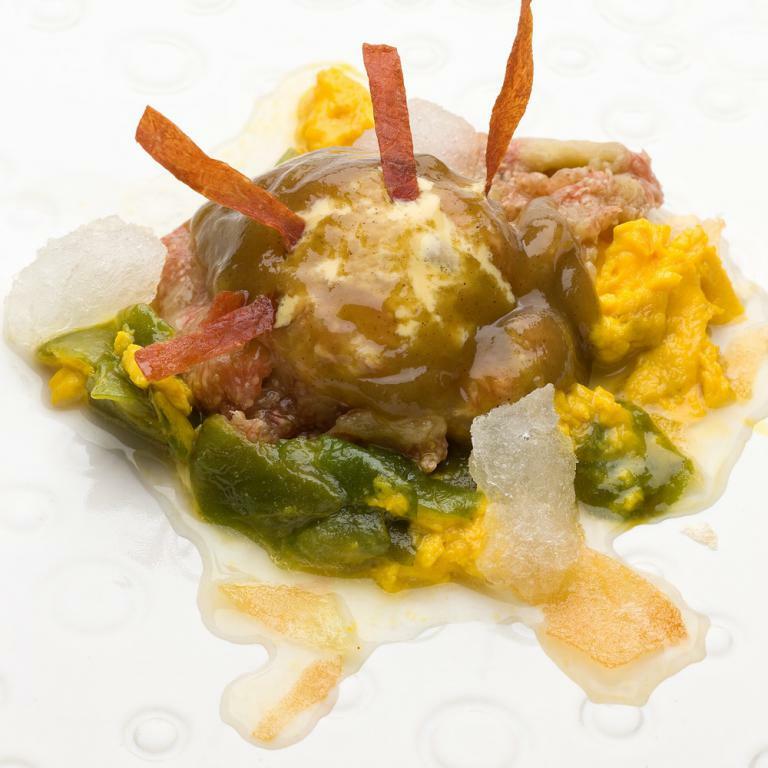 Place the frittata and the broken crisps towards the bottom of the plate, lay the ball of ice-cream above them, along with the fig puff, the jelly and the crispy ham; pour the sake water ice all around the dessert, so that it can be scooped up with a spoon along with the other elements.